Pi and 36 is our pathway to the stars. In the Barbury Castle Crop Circle of Pi, other views, Counting from outward in to the 36th spot, which is just before the decimal point, front side, is 666. One step further, would be the back side; 666+36= 703. The 3 “Pi Phrases” – (Pi Symbol) – (Pi Formula) & (Pi Infinite), the “Three Laws”, each individually total to the number of 666, by using the Sumerian Gematria System. Why is that!! Now adding these 3 “Pi Phrases” together, total to 1998. 666+666+666=1998. Subtracting 36, then equals 1962. 1962 is the adding of the four major components of our DNA. ADENINE = 312, GUANINE = 426, CYTOSINE = 660, and THYNINE = 564, = 1962. And what do many Crop Circles represent, DNA! Also, it is the phrase “Words Associated With Numbers”=1962. Now subtracting 36 from 1998, 36 times, = 702. The back side of the decimal point. One step further would be 666, the front side. This third Stage of the” Alphabets Code” that I have Created, I mean, Found, = 2106. The first 144 digits of Pi, thus = 666. Subtracting 144 from 2106 = 1962, DNA! The first 36 numbers, adding one after another, = 666. 2106 – 666 = 1440. 1440 is the Star of David, Two tetrahedrons, one overlapping the other, and one upside down, Forming the star. It is also the Masonic Symbol for the Illuminati, with the eye in the center. Meaning, someone is watching. Again, lets not forget when the Illuminati were founded, May First 1776. The Sumerian Gematria System, Says That, May First = 666, The only day of the year that does this. Why is that!! Lets go even one step further! 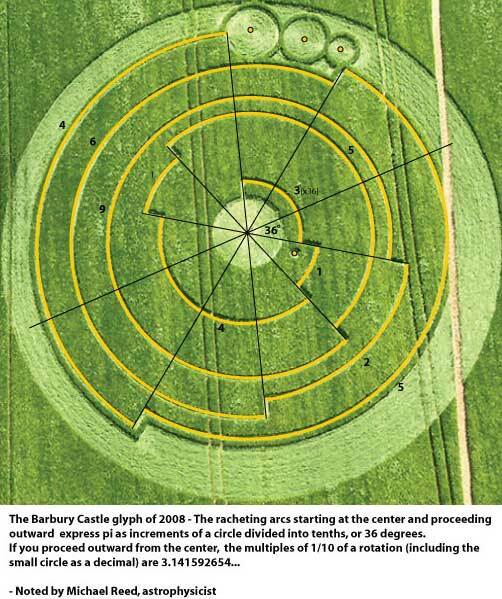 In this Barbury Castle Crop Circle of Pi, this is what you see! (p = 3.141592654…) What I see is this! The “Three Laws” [see 666, DNA, and Pi] of Pi, are, the “Pi Symbol”, which = 666. The “Pi Formula”, which = 666. And the last part, the 3 dots, which encodes the “Pi Infinite”, Is also = 666. 6*6*6=216, 216*6, the number of man=1296, 1296+666=1962, 1962+999=2961. The Circumference of “Perfection”. Pi and 36, Is our Pathway to the Stars.